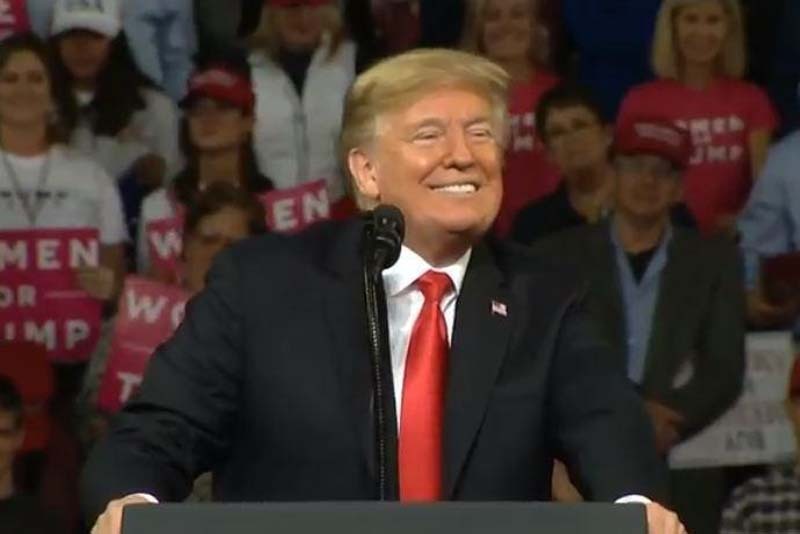 Shortly after President Donald Trump's Supreme Court appointment Brett Kavanaugh was sworn in, the president's fans cheered him on at a rally in Topeka, Kan.
Trump celebrated the historic night while stumping for Kris Kobach, running for Kansas governor, and Steve Watkins, the GOP nominee in a key congressional race. "I stand before you today on the heels of a tremendous victory for our nation, our people and our beloved Constitution," Trump said. Trump praised "incredible Republican senators for refusing to back down in the face of the Democrats' shameless campaign of political and personal destruction." "Since right from the moment we announced, radical Democrats launched a disgraceful campaign to resist, obstruct, delay, demolish and destroy, right from the beginning," Trump said. "Brett Kavanaugh is a man of great character and intellect." The U.S. Senate on Saturday by a 50-48 vote confirmed the Supreme Court nomination of Kavanaugh, who was sworn in a few hours later in a private ceremony. The confirmation process stalled in September amid allegations of sexual misconduct against Kavanaugh by Christine Blasey Ford, who alleges Kavanaugh sexually assaulted her when they were in high school. Leading up to the vote and lasting into the evening, hundreds of protesters convened on the Supreme Court steps shouting, ''We believe survivors." Protesters pushed past a police line, chanting, "November is coming," as they convened on the steps, some pounding on the doors of the U.S. Supreme Court after Kavanaugh's confirmation. Officers soon began detaining the protesters, whose hands were zip-tied before being led from the building. U.S. Capitol Police said 164 people were arrested during the protests for "crowding, obstructing, or incommoding." Before the rally, Trump tweeted that the protesters outside the Supreme Court were few, claiming the numbers were much smaller than media had reported. "The crowd in front of the U.S. Supreme Court is tiny, looks like about 200 people (& most are onlookers) - that wouldn't even fill the first couple of rows of our Kansas Rally, or any of our Rallies for that matter! The Fake News Media tries to make it look sooo big, & it's not!"